At ID Tech Solutions India, we are leading discount cards manufacturers in India. 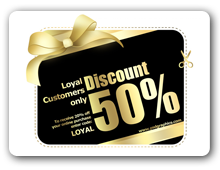 Our team of experts understands how crucial a discount program is for your business. We stride to ensure that our designed discount cards are your perfect marketing tool created for your specific sales promotion strategies when you want to attract new customers and retain increasing numbers of customers. Being prominent discount cards manufacturers, we print exclusive and impressive plastic discount cards that are custom built and designed to suit your business and customers for your loyal customers.